Littlemore Lounge shop and café is set in the grounds of Littlemore Mental Health Hospital, and is open to the general public. Curl up on our cosy sofas, browse our second hand clothes rail and in warmer months challenge a friend to a game of ping-pong or relax with a drink at the outdoor seating. Our delicious food and barista coffees are made fresh each day. 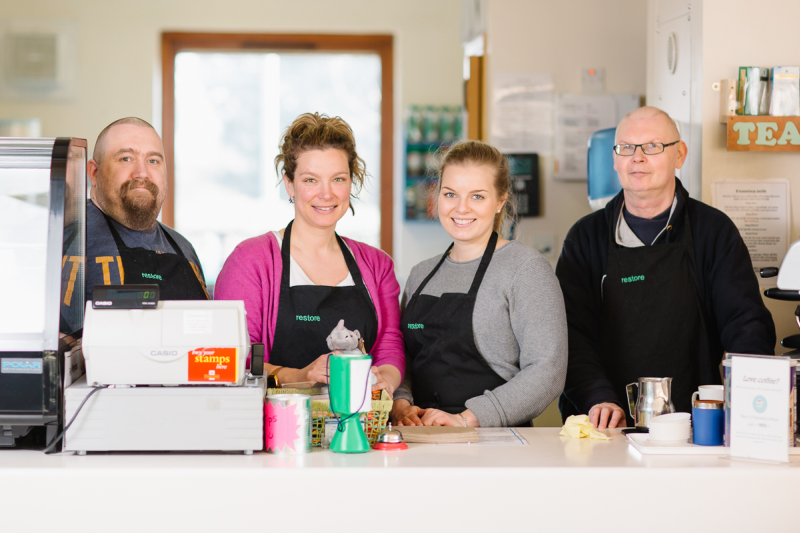 Our friendly shop offers a range of goods including daily papers and magazines, cold drinks, snacks, hand-made gifts and cards made by the members of Restore. Littlemore Lounge offers people with mental health problems the opportunity to gain experience in catering and customer service, develop confidence, and make a valuable contribution to the community. We offer a delicious selection of paninis, toasties, jacket potatoes, home-made soups and cakes. Food is sometimes made from the organic vegetables grown in our garden. We occasionally have to change our opening hours due to staff and member training. To find out about any planned closures, sign up to our daily email updates. You will find Littlemore Lounge in the grounds of Littlemore Mental Health Centre. See a map.